In 1996, Lara Croft burst onto the scene with the first Tomb Raider. Time hasn't been so kind, and over the years, her popularity has dipped. But with spin-off title Guardian of Light, is she back with a vengeance? 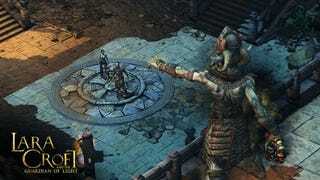 Unlike previous Tomb Raider titles, Lara Croft and the Guardian of Light uses an isometric third-person point-of-view. The game is a platformer and has Lara make her way through spider-infested tombs and poison-plant-covered jungles. As with any Tomb Raider title, the game does have its fair share of puzzles. And there is also a lot of combat — good, solid combat. Lara can draw weapons by using the right thumb stick and shoot with the right trigger. She can carry up to four different weapons, which can be accessed through the d-pad. The other twist is that the game can be played in co-op, with the second player controlling the Mayan warrior Totec. Yet, going into this Lara Croft title, I wasn't exactly excited. I wasn't unexcited, but I was just...indifferent. I've played Tomb Raider games, and recently, they've been so-so. But, this isn't a Tomb Raider game per se and boy, oh, boy, does Guardian of Light give the franchise a much needed breath of fresh air. Platforming And Puzzles: The platforming in Guardian of Light is great — surprisingly so. The running and jumping and dodging make for a fantastic experience. The levels are well-designed and strike the balance of intuitive and challenging. It gives the game an old-school, traditional feel. I don't mean that in the way the game looks, but the way it feels. Everything is well thought out and polished. There were moments where I didn't know where to go or I wasn't sure what to do, but the levels are laid out in such a manner that I never hit a wall and wanted to give up. I loved the sense of depth and perspective the levels have. The puzzles are likewise stellar, too. You can feel the wheels turning in your head as you solve them. Puzzles and platforming — it's the total package. Bang for Your Buck: Guardian is a stunner. The $15 game looks gorgeous. What's more, it's a big meaty game that allows players to get lost and explore. The game offers "challenges", such as moving a heavy sphere on a platform, and players can also acquire new weapons and artifacts. To acquire the optional artifacts, there are "side-rooms" that do not push the main story forward. The puzzles to snag that are as challenging as anything the game has to offer. It's refreshing to see so much effort go into something that some players will skip. The Voice Acting: Okay, the Lara Croft stuff was okay. Her lines weren't great, but they were serviceable. The rest is down right rotten. I don't remember hearing voice acting this bad in a long, long time. Everything else in this game is so damn good, it's frustrating that the developers couldn't seal the deal. It does not detract from the overall product, and I would certainly not say the game is a non-buy because of its terrible voice acting. Actually, it isn't a factor and does not affect gameplay at all. However, I hated it. Even in my lone wolf single player, I honestly do not remember the last time a Lara Croft game felt so satisfying. This is a great downloadable game. Playing it was a joy, and I loved how the developers were able to put a new spin on the series and keep true to the franchise at the same. After seven hours or so of play, Guardian of Light never great tired or dull. Welcome back, Lara, welcome back. Lara Croft and the Guardian of Light was developed by Crystal Dynamics and published by Square Enix for the Xbox 360 on Aug. 18. Retails on Xbox Live Marketplace for 1,200 Microsoft Points ($15). A copy of the game was given to us by the publisher for reviewing purposes. Played through the entire single player campaign.